Further evidence regarding the % efficiency of ALL ‘Upward-Flow’ filter boxes. 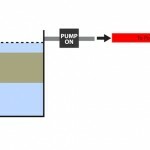 Once again, this is the animation already placed on this website that shows upward-flow water tracking to produce less than 20% efficiency has produced raised eyebrows and many doubts with Koi people around the world. I did expect this as the vast majority of current systems use upward-flow principles! I have had many requests for ‘scientific proof’ that what I profess is correct. Hopefully this should explain it all in detail. 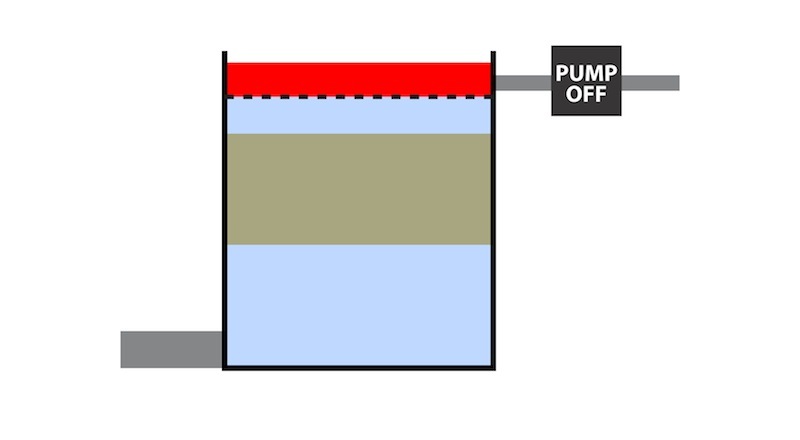 In order to continue the perfect upward-flow media coverage as seen on the first fill of the box the entire SURFACE water in the box coloured red must be pumped away evenly and in its entirety. By doing so the replacement water coming up evenly from directly below will replace the red band perfectly as per the first fill. 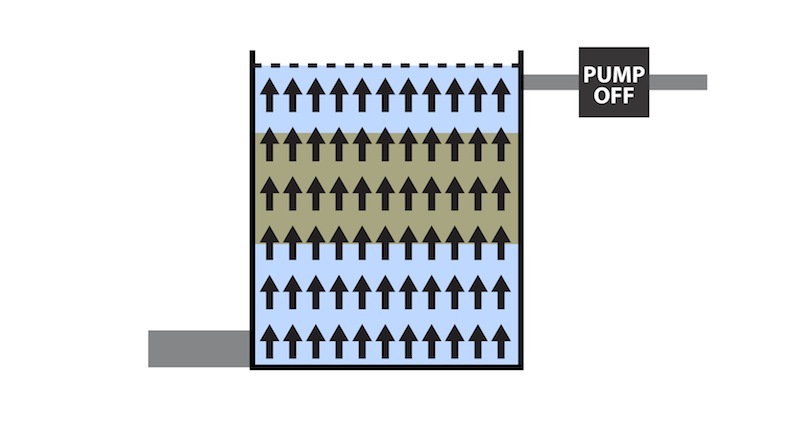 This is purely an illustration to explain how the pump must take the top surface layers of water away constantly and perfectly evenly in order to continue the perfect upward flow from directly below. 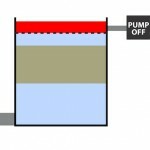 This shows how the water level drops in the box when the surface layer has been pumped out and now gravity will simply replace it from below. This shows the water rising to replace the surface water removed in the last graphic. It does give perfect coverage to all the media surfaces PROVIDING the entire surface water in the box is always moving and moving constantly. This, of course, is an impossibility as will be demonstrated later. Just as an example here, IF only part of the surface water is pumped away to the pond as seen here then it would show that the remaining part of the surface water has no movement whatsoever. 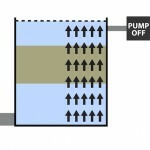 The incoming water would only replace the water removed directly from below as can be seen in the next illustration. 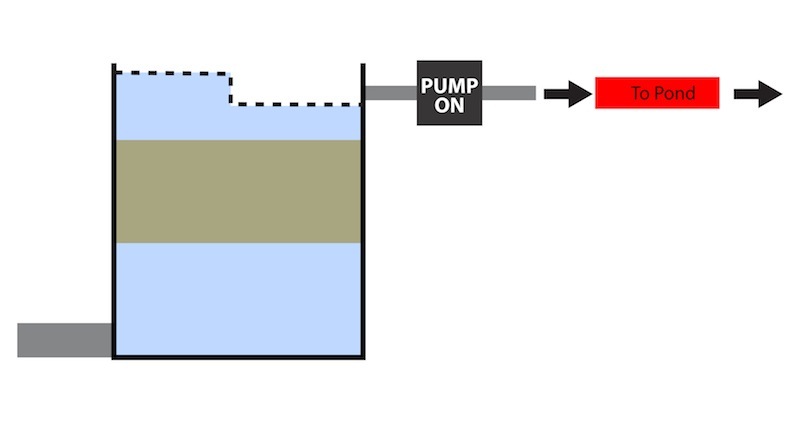 This shows the flow pattern of the replacement water as it compensates to replace the water pumped away in the previous illustration. As we can see only part of the media surfaces are now being covered. Of course it is an impossibility to continue the perfect upward-flow as is seen on the first fill. 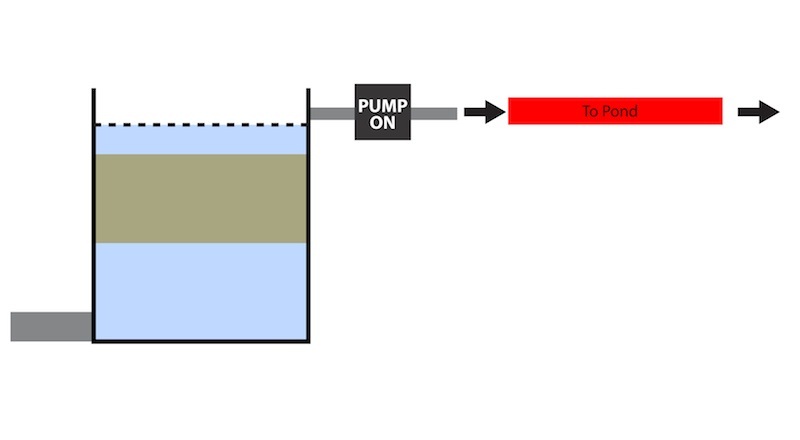 Once the pump is started or the overflow is activated (in the case of a pump-fed upward-flow box) the original water flow pattern changes dramatically. Incidentally this age-old inefficiency of very poor media coverage applies to ALL upward-flow boxes irrespective of how many (multi-chamber units) are linked together. 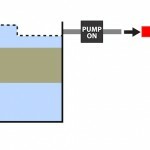 Furthermore transfer ports and exit weirs as opposed to pump pick-ups are equally as inefficient. 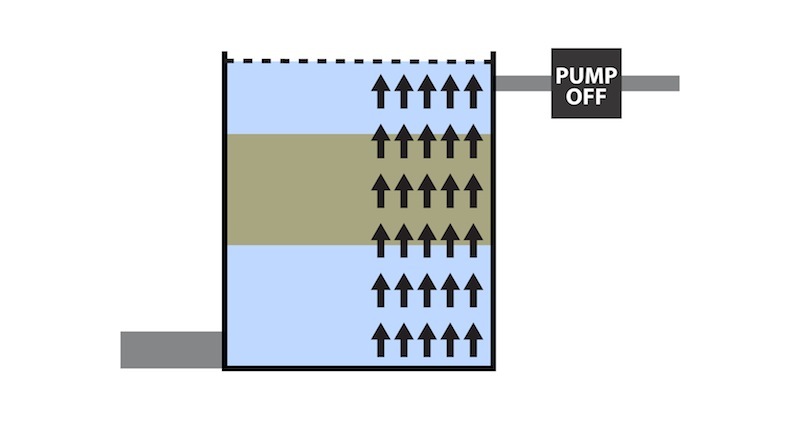 Whether the upward-flow box is heavily aerated or lightly aerated makes not one scrap of difference to the actual water flow-pattern as many suggest. Air bubbles produced at the bottom of the box simply travel directly vertically for the quickest escape exit. Whether static filter media is used or moving filter media is used neither of these can affect the actual water flow-pattern. Needless to say, by increasing or decreasing the pumping rate, this simply speeds up or slows down the water flow-pattern but it does not alter it. Once again, water either flows horizontally in nature and it also ‘falls’ but it never rises (except for nature’s geysers/hot springs) unless a water pump is employed. If we wish to alter the course of nature then we must accept the shortcomings in terms of very poor filter media coverage as is demonstrated on the video. 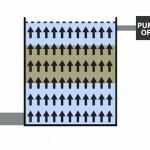 The truth of the matter is that the vast majority of the water inside an upward-flow box is static and will continue to be so until the box is emptied, even if this static water is aerated it is merely ‘aerated static water’! Of course, anyone can do the dye test themselves on all the water surface areas of any upward-flow box. Sorry, I did not ‘invent’ gravity – I am only the messenger!